In this article we’re going to be discussing what the best vocal looper units are, that are available to purchase in 2019. 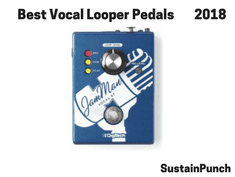 What are the best vocal looper pedals for vocals, guitar and other instruments in 2018? You might be wondering, what exactly is the difference between all of these TC Helicon Play processors. Well, just in case you are unfamiliar with what exactly vocal loop/voice loop pedals are, they are vocal effects pedals which contain the functionality to repeat an inputted signal, and output it repeatedly, whilst still allowing for the output of a real-time signal. This essentially means that you can record a section of chords, or accompanying guitar melody and then have this repeat in the background whilst you record vocals, or vice versa. This kind of effect is heavily used by such modern-day musicians as Ed Sheeran and Matt Corby. It’s important to note, there is a difference between a looper pedal and a vocal delay pedal, with the latter having the signal decay and fade out, whilst the looper pedal’s signal repeats at the same volume, without depreciation, until the footswitch is pressed and the pedal is instructed to stop the signal being sent to the speakers. If you’re here, you probably want to know what the best vocal loop processors are, alongside the reasons for this, well we’ve included our top …. voice looper pedals below, alongside video demonstrations of them all in use, so you can get a full idea which one will suit your needs more. Simple to use looper pedal for vocals and also microphone amplified instruments. Ability to overdub and undo instrument layers, to help build up the vibe and atmosphere and take it away, remember, it’s only in silence do we really appreciate the sound. Loops are automatically saved within the unit, and remain there even when the pedal is off, so you can easily load the loops. When deleting a loop, the processor seems to play 1 second of the loop that you want to delete before permanent deletion, hence it can be incredibly annoying for an audience, therefore we recommend turning down the sound if you are deleting loops whilst on-stage. 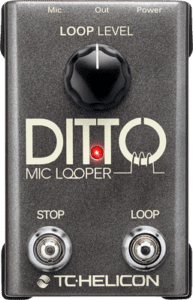 This looper unit is perfect for someone looking for a less expensive vocal looper unit, with the idea to use this in practices and small live performances. After the feedback we’ve received about this unit, we would recommend this to a hobbyist singer/songwriter/musician. 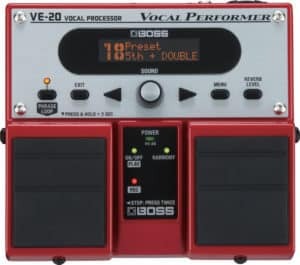 The BOSS VE 20 Vocal Performer is not primarily a vocal pitch correction pedal, it’s essentially an All-in-One vocal effects pedal solution, and is designed and produced by Boss, so you know it’s high quality. The pedal is 1.6kg it’s not the lightest in the world, but it more than makes up for it in its ability to add such creative vocal effects such as radio effect, strobe and vocal distortion pedal effects. Allowing for 38 seconds (mono) of looped recording, which is useful for singer-songwriters looking for an innovative way to build up their song’s live instrumentation, layer by later, directly in front of their crowd. 10 minutes of looping time…. Wow! 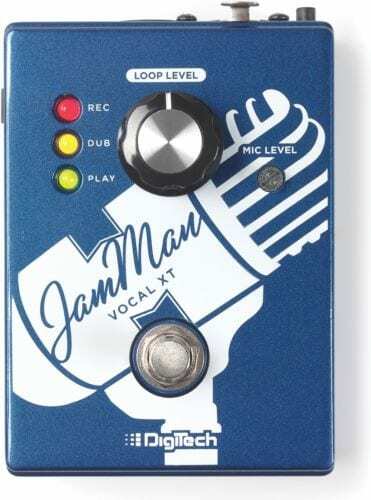 The JamMan Vocal is perfect for the avid live performing singer/songwriter and band member. DigiTech have really thought out the design of the pedal and its functionality in particular. The addition of Silent Clear, which essentially lets you delete a recorded phrase without requiring you to play it first, which eliminates one of those awkward moments on stage. With that being said, this is definitely a contender for one of the best looper pedals around. 45 Minutes Looping time (8 Mins per track limit) – That means you can record plenty of vocal loops! 1 XLR in, 2 XLR out, TRS in (Vocals), Instrument In/Thru, Guitar Direct Out, Aux in, SPDIF, Headphone Out, Exp pedal in. Now this will be the perfect multi-effects processor for most professional singers. with the capability to play backing tracks, then I would suggest looking at the VoiceLive 3 Extreme. The only downside to this device is that it lacks the Midi Syncronisation that the original version has. There’s no surprise that TC Helicon has again made it into our pedal recommendations, they have provided a really solid multi-effects pedal that features a stellar looper processor. You simply cannot go wrong with this TC Helicon VoiceLive 3 Extreme processor. The multi-effects vocal solutions we offer are certainly a must for singers looking to transform their performance. You can have a pedal for both studio/live use that has a surplus of functionality. It really is a small price to pay for such a large sounding difference, suitable for the professional singer/songwriter. 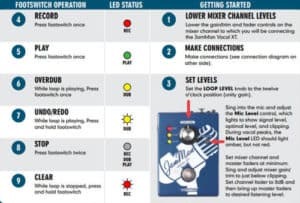 However, the pedals differ in their guitar effect functionality, as you can see from the chart below. As you can see from the VoiceLive Play, Electric & Acoustic comparison chart. Despite the pedals looking very similar and having an identical core functionality, there is a huge difference in guitar effects functionality. Therefore, for singers who play either the electric or acoustic guitar, the VoiceLive Play Electric or VoiceLive Play Acoustic is certainly the most appropriate processor to choose. For singers who do not need the added functionality of having an integrated guitar effects processor, I would suggest using the original VoiceLive Play.